Figuring out how to manage batteries can be as easy as “1-2-3.” One (1), throw alkaline (non-hazardous and use-once) dry-cell batteries into the trash; two (2), recycle rechargeable batteries using Call2Recycle® drop-off boxes; and three (3), take all other types of batteries to a household hazardous waste disposal program where they will be properly managed as hazardous waste. Click here to view this information as a 2-page, downloadable and printable PDF. 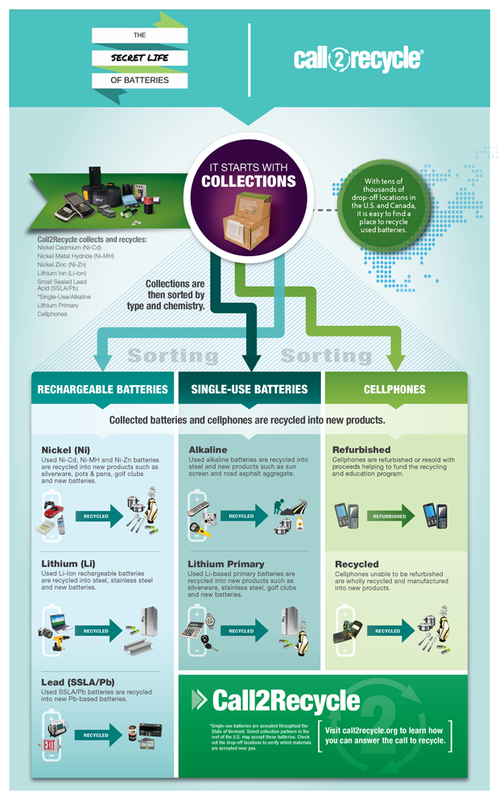 Municipal Drop-Off Locations - With the 2010 USDOT change in regulations regarding the transportation of waste batteries, the MCMUA no longer accepts mixed batteries from municipal collection points and depots for recycling. Municipalities and residents are now encouraged to mange their spent batteries according to the "Easy as 1-2-3" suggestions listed on this page. 1. Alkaline Batteries - Use-once alkaline batteries such as AAA, AA, C, D and 9-volt batteries produced by manufacturers like Energizer and Duracell as well as less common and/or generic manufacturers now fall below Federal and state hazardous waste standards and can and should be thrown out in the ordinary garbage. These batteries types account for the majority of batteries discarded. While regulations do not required these non-hazardous batteries to be individually bagged or have their terminals covered, prior to placing into the garbage, it is still prudent to do so in an effort to minimize the risk of fire, especially with 9-volt batteries. The MCMUA and most Morris County municipalities stopped accepting alakaline batteries for recycling in November 2009. Note, this category also includes carbon zinc (heavy duty) batteries which can also be disposed of in the garbage. 2. Rechargeable Batteries - The Rechargeable Battery Recycling Corporation (RBRC) operates Call2Recycle®, a free rechargeable battery recycling program. 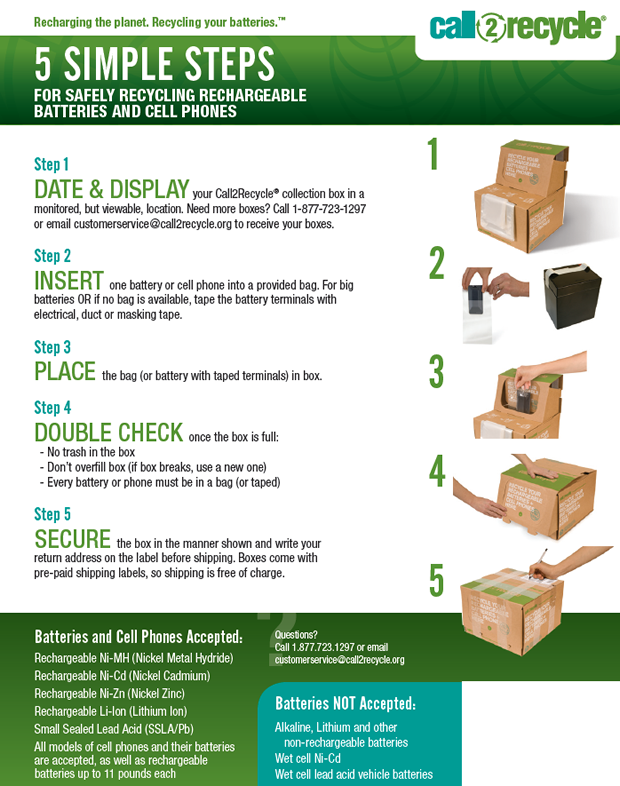 Call2Recycle® sets up retailers and public agencies as rechargeable battery drop-off locations at no cost to the participant. Currently, Home Depot, Radio Shack, Lowe’s and Verizon Wireless all participate in the Call2Recycle® program at all their retail locations. These locations are provided with a drop-off box with small plastic bags so the batteries can be individually bagged in accordance with the new DOT regulations. The RBRC pays all the costs associated with providing drop-off boxes, including transportation and recycling. Call 1-877-2-RECYCLE or use their website at http://www.call2recycle.org to find the closest public drop-off point. Additionally, Call2Recycle® will provide free-of-charge drop-off boxes to any non-residential entity for the collection and recycling of their own rechargeable batteries. All one has to do is sign up online at http://www.call2recycle.org. Retailers and community recycling centers open to the public will be listed on the Call2Recycle® zip code locator and toll-free help-lines to encourage residents to recycle. Additionally, public agencies and businesses can still participate in the Call2Recycle® program without being advertised as a public drop-off location if they do not want to listed as such. Since everything is free of charge, the MCMUA is encouraging every business and/or public agency to request a drop-off box for its office or work site. In addition, the stores listed below are likely to accept rechargeable batteries for recycling but please contact them first hjust to make sure. Rechargeable batteries are found in cordless power tools, cellular and cordless phones, laptop computers, digital cameras, two-way radios, camcorders, and remote control toys. Rechargeable batteries sometimes look like regular alkaline batteries. The label on the battery will indicate if it is rechargeable. Note, cell phones can also be collected through the Call2Recycle® program. 3. Other Batteries - Non-rechargeable and large (over 11 lbs) lead-acid batteries make up this category. The proper management for these batteries is to take them to a household hazardous waste disposal program. Information about Morris County’s household hazardous waste programs can be found at the MCMUA website or by calling 973-829-8006. Button Cell Batteries - Most of these batteries still contain mercury and should be taken to a household hazardous waste program for proper management. Lead-Acid Batteries - While rechargeable lead-acid batteries contain lead and are often used for car and boat batteries (over 11 lbs) should also be taken to a household hazardous waste program. Disposable Lithium Batteries - Use-once, non-rechargeable lithium batteries (AA, C, 9 volt and coin); mainly used in computers and cameras, are reactive with water, and can cause serious fires. If lithium batteries are non-rechargeable they must be delivered to a hazardous waste program for proper management. Hazardous batteries burned in waste combustion facilities can release mercury or cadmium to the air and water, ultimately entering the food chain and posing health threats to people and the environment. With the adoption of the Morris County Recycling Plan Update as of October 2007 only hazardous dry cell batteries are mandated to be source separated and recycled. Non-hazardous dry cell batteries are acceptable and are to be disposed of in the solid waste stream (trash). Keep reading below for additional information on this distinction. In addition to rechargeable batteries which are hazardous and need to be recycled, non-rechargeable, hazardous batteries such as non-rechargeable lithium, silver oxide, mercury and magnesium button-type batteries, etc. need to be brought to a hazardous waste disposal program for proper management. It should be noted that domestically manufactured alkaline and carbon zinc non-rechargeable batteries made after circa 1994 eliminated mercury content to the point that they are not be considered hazardous and therefore are not included in the list of materials mandated to be source separated and recycled. The proper management of these non-hazardous batteries is to throw them in the regular garbage. Store in a secure, dry place out of the reach of children and pets. Button batteries can be swallowed because they are small and slippery. When storing rechargeable batteries for collection, keep in a vented, non-metal container. Rechargeable batteries should be placed individually in plastic bags before being stored together with other rechargeables.